After the 1960's tragedy and thalidomide being taken out of use, not all the drug was destroyed. A few years later, the story took a surprising turn by means of an Israeli doctor. In 1965 the doctor was treating leprosy patients. One in particular had developed a bacterial infection coupled with inflammation. After stumbling across some thalidomide, remembering it was a sedative, the doctor administered it in the hope it would help the patient sleep and ease his pain. Remarkably, in the morning the swelling had being brought under control. This extremely fortunate discovery lead to research on the effects of thalidomide on inflammatory diseases. 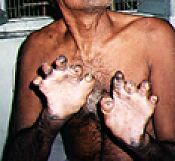 Leprosy is a horrific desease which still causes suffering in parts of the world. Any new medicines which might help irradicate it are desirable. When our bodies encounter foreign matter cells they become injured and release a protein which increases blood flow. This can cause serious inflamation if the body overreacts. Thalidomide is able to block one of the proteins and stop the body over reacting, surpressing the defences. This is not the only situation in which Thalidomide has proved effective. Since it reduces growth of blood vessels, it has been tested on cancer patients, as tumours require new blood vessels. It has been used to treat weight loss associated with AIDS/HIV and on Chron's disease patients. It has also been studied for its potential property of stopping HIV progression. A drug with so many possible benefits would usually be heralded a wonder drug, but the dark side of this compound means some people will never be happy for it to be on the market. Former victims, although afraid to see it re-introduced, don't want to deprive those who could benefit from its positive side of a chance to do so. It's a difficult situation to risk using this drug. No matter what precautions are taken there is always a high chance more mutated children will be born if it is being used. Some victims have said they would rather it was used properly and legally than banning it and forming a black market. At least then, every effort can be made to educate people and control the drug. They are determined however that the drug should always be called 'THALIDOMIDE' and not sold under a trade name. The target for all should be to produce drugs with the positive effects of Thalidomide but without the side effects. Celgene Corporation have already produced new therapeutic products structurally related to Thalidomide. 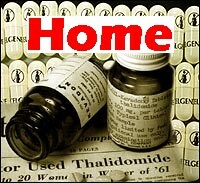 Some of these compounds show up to 4000 times the potency of thalidomide and many have lower side effects. Hopefully I'll be able to update this page soon with news of a replacement.